Jeremiah Owyang from Altimeter Group shared research on how Paid, Owned and Earned is converging into one single form of media. Slow load times aren`t just a minor annoyance. They`re a major burden to your site`s traffic and conversion, driving up bounce rates and turning visitors off your brand. Deepak Chopra shared on Linkedin inspiring article: The Conscious Lifestyle: The Soul of Leadership. L = Look and listen. 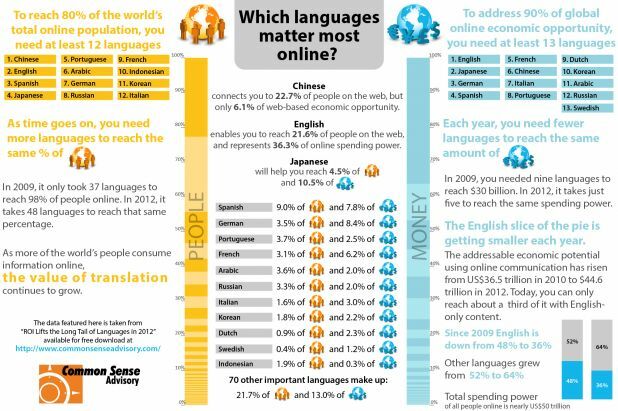 Infographic: Which Languages Matter Most Online? To reach 80% of the world`s total online population, you need at least 12 languages. English enables you to reach 21.6% of people on the web. Represents 36.3% of online spending power. Chinese connect you to 22.7% of the people on the web, but only 6.1% of web-based economic opportunity. This robust presentation compiled by KPCB partner Mary Meeker explores the significant trends shaping the internet today. I encourage to view full presentation for an overview of the digital trends that surround us in today’s world. Registering a staggering 84 percent increase in value over the past year, Apple has emerged as the most valuable brand in the world, ending the four-year reign of Google at the top of the table in the sixth annual BrandZ Top 100 Most Valuable Global Brands study. The Apple brand, as calculated by Millward Brown Optimor, a WPP company, has increased in value by 859 percent since 2006 and now stands at $153.3 billion. Other key findings in the study are that during the economic recovery of the last year, the combined value of all the brands in the top 100 has risen by 17 percent and is now worth $2.4 trillion. In terms of geography, according to the 2011 BrandZ study, 19 of the Top 100 brands now originate in “BRICs” markets, versus only two in 2006.